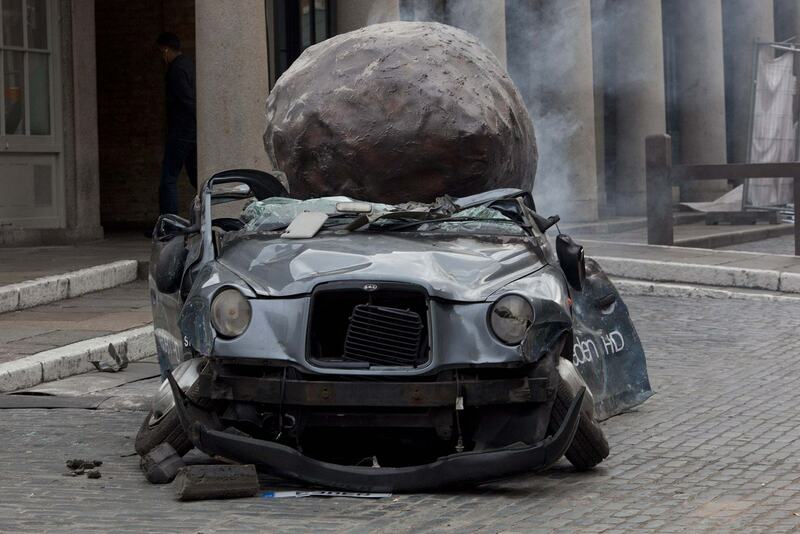 Londoners awoke this morning to news of a meteorite which struck a taxi in the heart of the city’s busy shopping district Covent Garden. Witnesses were left stunned by what looked like a scene straight out of a science fiction film. An incident team arrived almost immediately to cordon off the meteorite and keep the public at a safe distance. Of course, the “things to come” turn out to be 4 weeks of science programs on Eden TV’s Science Month, which starts up in July. The incident was in fact a well-orchestrated publicity stunt by the UK’s Eden TV (Sky 532 Virgin 208). Science Month will run all day every day during the month of July. Highlights in the first week include Wonders of the Universe (Monday 2 July at 9pm), Finding Life Beyond Earth (Monday 2 July at 10pm), The Code (Wednesday 4 July at 10pm) and Deadliest Volcano (Thursday 5 July at 7pm). What Does Conan O’Brien Think About Space Exploration? I wanted to know, so I decided to ask him. And thanks to “Team Coco” and Google Plus, I was able to — last night at 9:30 p.m. Central/7:30 p.m. Pacific, to be exact. On Monday afternoon, Team Coco — that is, the Google Plus page for comedian and late-night TV host Conan O’Brien — posted a video contest where five lucky “Plussers” would be able to participate in Conan’s first-ever live Google Hangout. All you needed to do was record and post a video question on your Google Plus page, and tag #AskConan on the post. I figured I’d give it a shot, and recorded a quick webcam video wherein I asked Mr. O’Brian what his feelings were on the future of space exploration. Because, honestly, that’s what we all want to know. The next morning I had a response from Team Coco… they liked the video and wanted me on the Hangout. So I got to participate, and ask Conan himself — er, myself — um… I got to ask Conan himself, myself! There were five of us all together on the Hangout, along with Aaron, the moderator, and of course the comedic maestro, Conan O’Brien. After some time prepping to make sure everyone’s lighting and sound were ok and the internet connections were reliable, and basically chatting among ourselves and getting to know each other, we finally went live on Google. The result is above, for better or worse… hey, it was live! Enjoy. As far as the answer to the question goes, you can find that around the 16-minute mark. I don’t want to spoil the surprise, but let’s just say that a late-night TV host has certain…priorities…to keep in mind, and above all, Conan is ultimately a businessman. A funny, funny businessman with an endless supply of gag props. So check out the video, follow Team Coco on Google Plus and, if you’re a fan of Hangouts be sure to catch Universe Today’s own Space Hangout every Thursday (which I am also a participant in) on our fearless editor Fraser Cain’s feed here. And next time you see a video contest in your Plus feed, enter it! You never know who you’ll end up hanging out with.